I sometimes get jealous when I see what cool stuff people from other countries get to do. But you know what they do not have? they are allowed to walk anywhere…we just clamber on top and look at the view. In Israel we have quite a few ancient aquaducts built during the Roman empire. 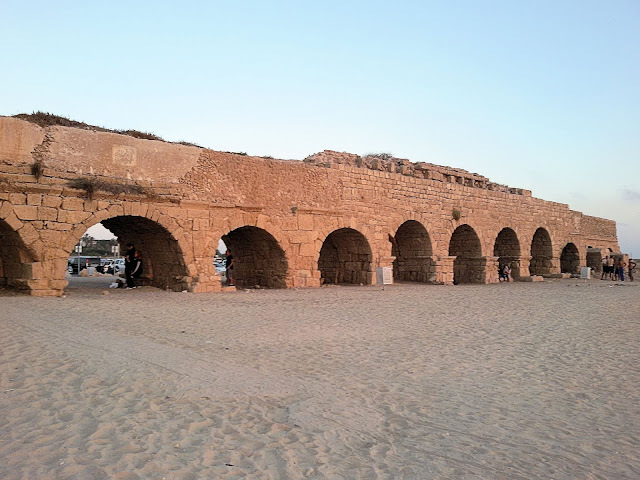 They are dotted all over the place but the aquaduct in Caesarea is the one that I walked on. 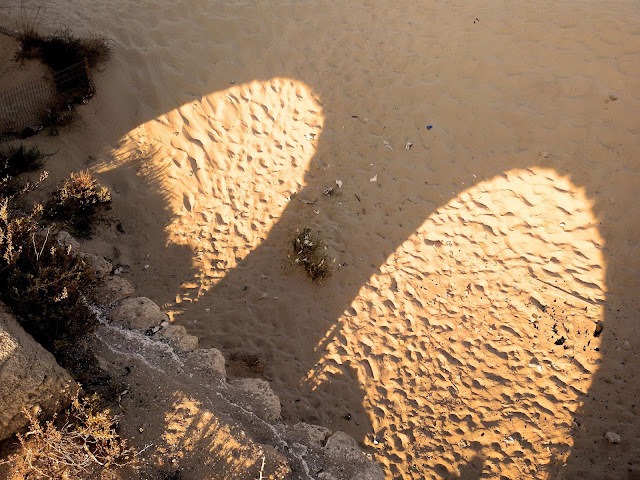 It runs parallel to the beach and its arches give shade and shelter to the beachgoers, nargilla smokers and other partygoers. 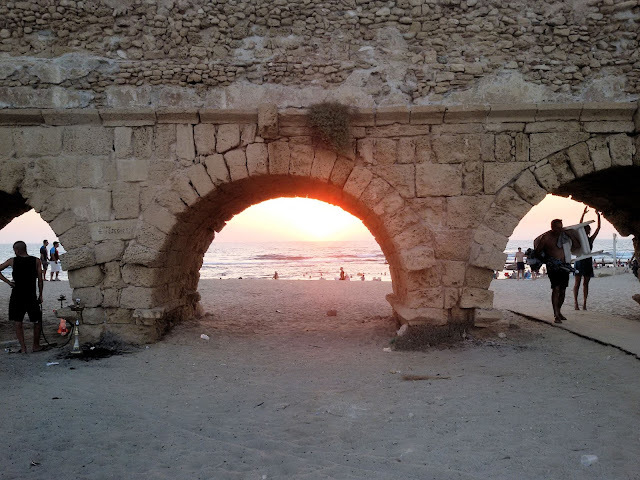 One often forgets that Israel is such an ancient place because it has such a progressive, startup-y vibe. But then you find yourself swimming in the Mediterranean sea and notice a strange squarish-looking rock. Only to realize a bit later that you are actually swimming in a small ancient harbour. The weird rock is actually an ancient building stone. 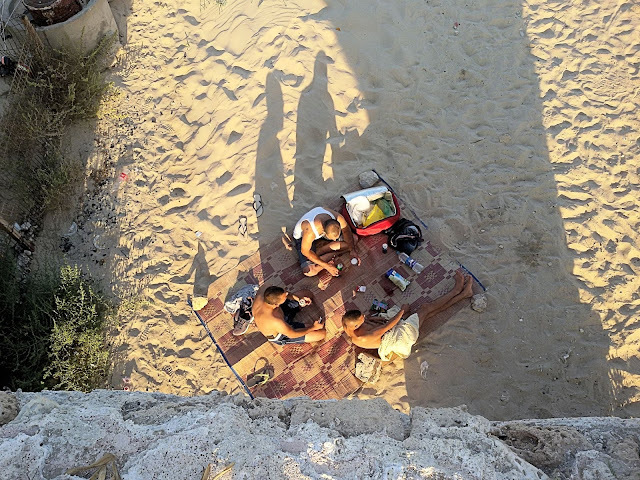 Or you can find yourself on top of an ancient aquaduct looking down at the swimmers in the sea on the one side, and a group of Arab guys hanging out and smoking the nargilla on the other side. 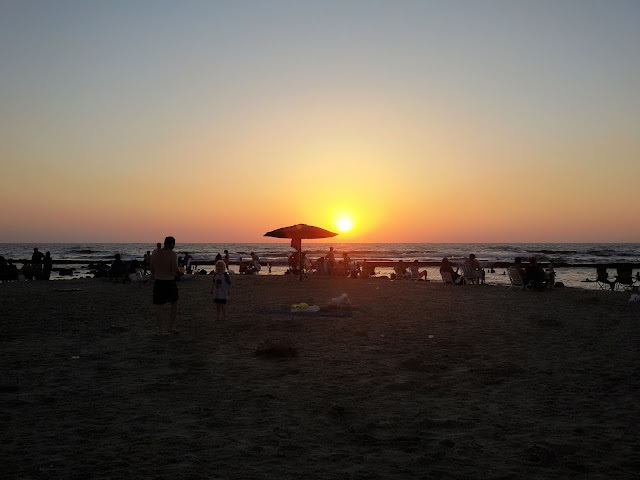 Everyday Israel has a 'new' feel to it. There is constant building everywhere and skyscrapers are mushrooming all over the place. It is nothing at all like that ‘medieval’ feeling that what one experiences in the old Europeans cites. Israel have been built during the last 70 years. Since Israel gained independence in 1948. BUT...and this is a really HUGE BBUUUTTTTT, there is a huge proportion of ancient architecture in Israel. The Armenian quarter in Jerusalem. The earliest churches there were built during the 5th century and the rest of the place around the 12th century, so they have been around for nearly 2000 years. The Al-Aqsa mosque on Temple Mount was built around 705 AD, making it 1,313 years old. The Al-Jazzar mosque in Akko was built around 1781, making it 237 years old. great engineers and one can still see a lot of their architecture that was built nearly 2000 years ago here in Israel. The Jews and the Romans did not get along and everything blew up in 70 AD. The Second Temple was destroyed and the Jews were killed or sold into the slavery. Jerusalem was razed to the ground and Judea was renamed Palaestinia. And now here we are in 2018 and the Jews are restoring and preserving the architecture of their old enemies. How times have changed, hey? And then there is the ancient view back into the past. It is more of a feeling actually. The feeling that you get when you realize that the stones under your feet where placed with extreme accuracy by a builder more than a thousand years ago. A builder who most probably also had a family that he loved. Friends who he liked to hang out with. I am sure that he must have enjoyed the sea breeze in the late afternoon just I did. 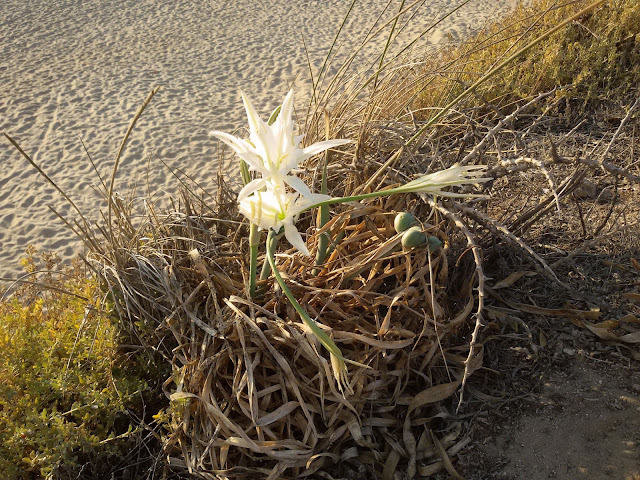 As I stood there quietly in the breeze looking over the Mediterranean, a mother and young boy suddenly called me from below and asked how they could get up too. I pointed them in the right direction and then started to make my way down. The view is great from the top of an aquaduct and it was time to give someone else a turn.